Photo: Tom Westcott/IRIN. Two soldiers from forces operating under Libya's Tripoli-based government walking through the deserted streets of Bin Jawad. BIN JAWAD, 27 January 2015 (IRIN) - Six weeks ago, Bin Jawad was a sleepy coastal town, home to a community of oil workers, shepherds and fishermen. Today there is no fishing. The town’s entire population - over 11,000 according to a 2006 census - has left. Houses stand deserted and the streets of this ghost town are littered with the spent shells of anti-aircraft guns. The residents have sought refuge in remote desert encampments or cramped village accommodation nearby. 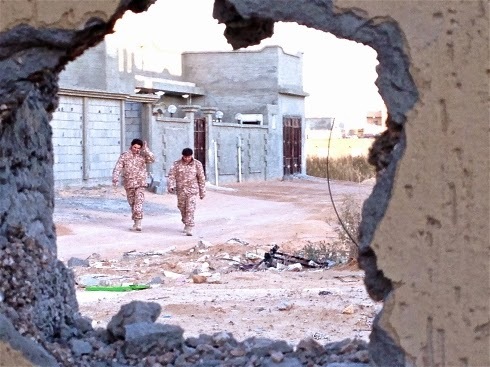 The town is on the front line between Libya’s two rival governments. The internationally recognised one – the winner of last year’s elections – was forced out of the capital Tripoli in August 2014 and is now based over 1,000 kilometres away in the eastern town of Beida. Many of its supporters are pushing for greater autonomy in the east. The other, which continues to control Tripoli, is run by the Libya Dawn political military movement and its allies and has resurrected the country’s former parliament, the General National Congress – a rival to the internationally recognised House of Representatives. The two - both of which include Islamist and secular elements - command loose coalitions of fighting groups that have been involved in fierce clashes across the country in recent months. Elements of both sides are also currently in Geneva at UN-brokered peace talks, though not the Libya Dawn which is boycotting, with the UN envoy warning that "time is running out." In Bin Jawad, forces affiliated with Libya Dawn arrived in mid-December in a bid to gain control of some of the country’s vital oil infrastructure, and since then the town has been subject to almost daily aerial bombardment from the Libyan National Army (LNA), the military of the Beida-based government. Residents left gradually at first but, as the airstrikes intensified, everyone fled, with the last few remaining residents escaping a fortnight ago. The poorest, who could not afford to travel far, hurried into the safety of the desert. Other families drove to nearby towns and villages where most have since been housed in makeshift accommodation in schools and public buildings. Thinking the conflict would be short-lived, they took just a few possessions, but have now been unable to return to their homes for over a month. Heavily reliant on local support, they have few resources and are now also facing a shortage of cash. According to the UN's refugee agency, UNHCR, there are an estimated 400,000 internally displaced people (IDPs) in Libya, including those who lost their homes during the 2011 revolution. These people remain amongst the most overlooked victims of the last four years of instability in Libya. The importance of Bin Jawad is its location just 30 kilometres west of Es Sidra,the country’s largest oil export terminal, over which rival armies are battling for control. Improvised fighting vehicles, known as ‘technicals’, whizz between the two towns. The only people left in the town are members of the Third Force. A unit within the country’s largest armed group - Central Libya Shield - the Third Force now operates under Libya Dawn. The Third Force is using Bin Jawad as a base from which to try to take control of the Sidra oil terminal, with the LNA using its air power to repel attacks. “On the first day we arrived, our field hospital was attacked [by an airstrike] and two doctors were killed,” Salah El-Jabu, commander of the Third Force unit stationed at Bin Jawad, told IRIN. “They also tried to attack a local power station, and numerous civilian homes have been hit.” He estimated that an average of five bombs fall in the vicinity of the town on any given day. The Third Force has recently started using a few of the now-deserted buildings, including a school which acts as a field hospital. Sidra is one of three oil ports under the control of Ibrahim Jadhran, a self-styled federalist leader who was pushing for more regional autonomy. From the summer of 2013, when he headed a unit of the PFG, he led a year-long blockade of the ports as part of a dispute over distribution of the country’s oil wealth, which crippled Libya’s hydrocarbon industry. Although the oil ports were technically returned to the eastern government’s control last year, Jadhran re-tightened his grip when Libya Dawn took over Tripoli. Initially neutral between the opposing sides, when Tripoli-government forces made a move on the ports, he pledged allegiance to the institutions in the east and is now fighting alongside the LNA to keep control of the oil terminals. Both Sidra and a second oil export terminal at Ras Lanuf are now closed, placed under force majeure by Libya’s National Oil Corporation. Employees say they were not paid last month and have no idea when the situation will improve and they will be able to return to work. An imminent return seems unlikely: as long as the Third Force is in town, it will remain a target for the LNA. The residents feel completely sidelined and say they have yet to receive any support from either government. “No-one has asked if we need help,” Fadeal said. A visit to the Tripoli parliament to explain the town’s humanitarian crisis garnered promises of help. None has materialised. And the location of Bin Jawad, on the edge of a war-zone, means their plight has gone largely unreported, both nationally and internationally. UNHCR told IRIN its efforts to access IDPs had been hampered by ongoing clashes. “We continue to explore all possible options to bring aid into this area,” said spokesperson Dunnapar Fern Tilakamonkul. However, based in neighbouring Tunisia since the security situation in Libya deteriorated, the reach of UNHCR and other aid organisations is limited. According to people from Bin Jawad, the only support so far has come from the Third Force, whose very presence provoked the aerial bombardments that forced residents to flee. Even if the fighting stops, the town will still not be safe enough for residents to immediately return. For the time being the families of this remote coastal town hav now become just another statistic in Libya’s fractured civil war.